Though most exit polls had forecast a victory for the TRS in Telangana, some had predicted a close contest with the People's Front led by the Congress. TRS chief K Chandrasekhar Rao was leading over his nearest Congress rival in the Gajwel assembly seat. The ruling TRS looked set to sweep the assembly polls in Telangana today, with its candidates leading in 90 constituencies, leaving challenger People's Front led by the Congress way behind. Trends were available for all except one of the 119 seats of the state assembly. The Congress, which sew up a four-party coalition, is leading in 15 seats, its ally the TDP in one, while Asaduddin Owaisi's AIMIM that backed the TRS was leading in five. BJP nominees were ahead of their rivals in four constituencies and others were leading in three. 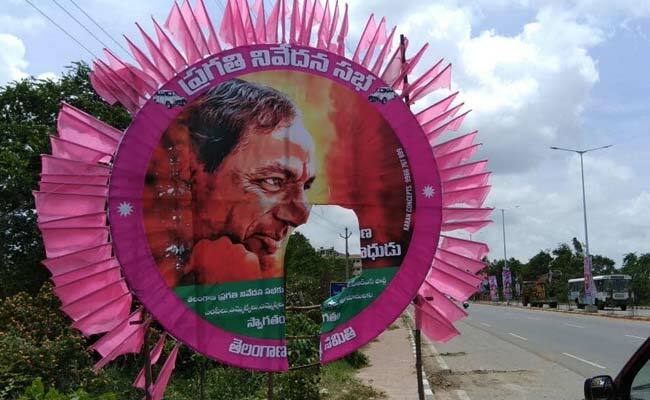 Telangana Rashtra Samithi (TRS) chief K Chandrasekhar Rao was leading by 9,212 votes after the fifth round over his nearest Congress rival Vanteru Pratap Reddy in the Gajwel assembly constituency. His son and minister KT Rama Rao is leading in Sircilla by 15,096 votes after the third round of counting over his Congress rival KK Mahender Reddy. In Siddipet, Mr Rao's nephew and a minister in the government T Harish Rao was leading by 26,098 votes over his nearest Telangana Jana Samiti (TJS) rival Bhavani Reddy after the fourth round. Telangana Congress president N Uttam Kumar Reddy was leading in Huzurnagar by 1852 votes over his nearest TRS rival Saidi Reddy after the third round. Though most exit polls had forecast a victory for the TRS, some had predicted a close contest with the People's Front led by the Congress which also includes the Telugu Desam Party, CPI and the newly formed TJS. The opposition alliance, however, appeared set for a defeat in Telangana. Congress, though on course of making major gains in Rajasthan, Madhya Pradesh and Chhattisgarh, failed to make inroads into the citadel of Mr Rao, widely credited for the creation of Telangana. Congress, too, claims credit for the formation of Telangana, but that apparently did not cut much ice with the electorate. The BJP, which had contested the last assembly elections held in 2014 in undivided Andhra Pradesh in alliance with N Chandrababu Naidu's TDP, entered the electoral fray alone this time but appeared to have failed to make much headway. The TRS initially had a slender majority with 63 MLAs in the outgoing assembly but it fortified its position after nearly 20 MLAs from other parties switched over to it. The Congress had won 21 seats in Telangana in 2014 elections and the TDP, 15.